There are supposed to have the BR IC225 '91' (GEC Class 91) and the BRCW '81' (AEI AL1) to be appear in TTO. I have no idea why they were cut in the final release. The GEC Class 91 was replaced by the TIM and the AsiaStar, mainly because there wasn't one train from another country than Great Britain. Cool find! What magazine is that from exactly? It's from the German PC Player magazine. Ah! It's this one: http://www.tt-ms.de/presse/ttopcp7.jpg I knew that screenshot looked familiar. Legend has it that MicroProse wanted real vehicle names removed from the game at some time during the transition from TTO to TTD. They allegedly were afraid of lawsuits from the companies. Perhaps there's a similar reason for this name change prior to the release of TTO? 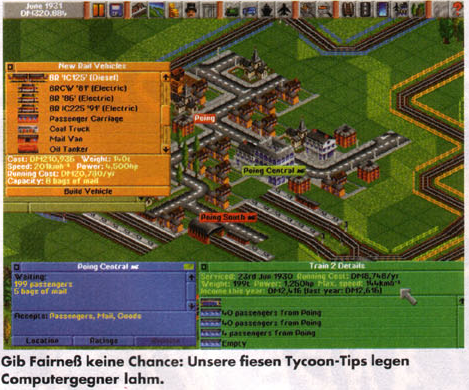 The original Transport Tycoon had the T.G.V. and the Eurostar of course. It looks like the BR '87' was missing from that demo as well. Actually...before release it didn't have the T.G.V nor Eurostar. It had the 'BRCW' 81 and the 'BR' 91 IC225.